The book behind the hit TED Talk**The Sunday Times Bestseller**Economics is broken, and the planet is paying the price. Unforeseen financial crises. Extreme wealth inequality. Relentless pressure on the environment. Can we go on like this? 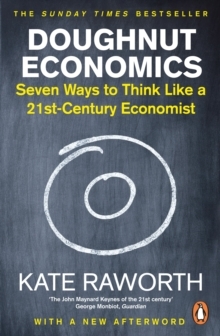 Is there an alternative?In Doughnut Economics, Oxford academic Kate Raworth lays out the seven deadly mistakes of economics and offers a radical re-envisioning of the system that has brought us to the point of ruin. Moving beyond the myths of `rational economic man' and unlimited growth, Doughnut Economics zeroes in on the sweet spot: a system that meets all our needs without exhausting the planet. The demands of the 21st century require a new shape of economics.